Adjusts from 52" to 90"
We know, it can seem a little weird to see a shower curtain rod for your dorm room on this site. After all, most dorm rooms don't have a shower in them and you have to go use the communal showers. But if you're lucky enough to have your own bathroom in your dorm room you need to be prepared. And if you need to hang up your dorm shower curtain, we have the perfect accessory for you. The Shower Curtain Rod - Constant Tension® will help you easily find the perfect tension so you can quickly set up your college shower with the best dorm curtain rod technology. This essential college item can also be used to hang curtains across your window if the dorm room allows it. 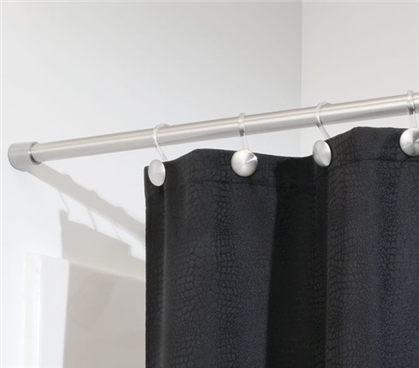 The tension technology in this stainless steel dorm shower curtain rod allows it to adjust from 52" to 90" so you can get the perfect fit. This essential college shower curtain road is corrosion and rust resistant, so you don't have to worry about using it semester after semester.